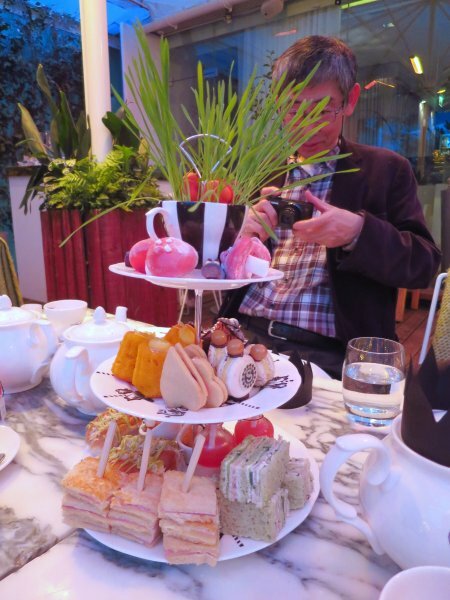 A good friend, Yoshi, visited us at the end of January for a few days, and during his stay we went to have an Alice afternoon tea. 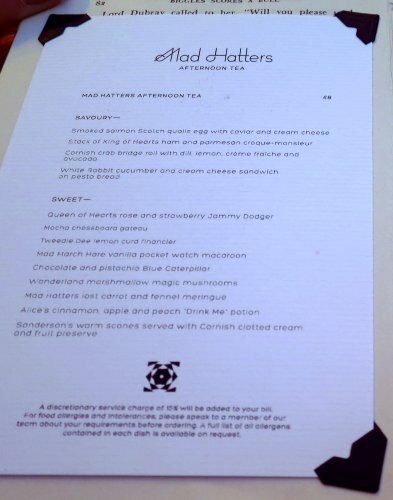 As I've mentioned in the past, Yoshi has taken us to a couple of charming Alice themed restaurants in Tokyo, but we hadn't found anything exactly similar here. This, though, was very a great find, and very interesting. The Sanderson Hotel has an unusual decor featuring quirky and unusual furnishings in the public spaces, including an animated reception desk, a delightful twinkly bar serving Alice style cocktails, and a splendid elevator whose walls are clad in a three-dimensional depiction of outer space. Many years ago, the hotel was a giant showroom for the Sanderson furnishing fabric company, and I have dim memories of roaming through fascinating full sized room sets showing off the company's wares. 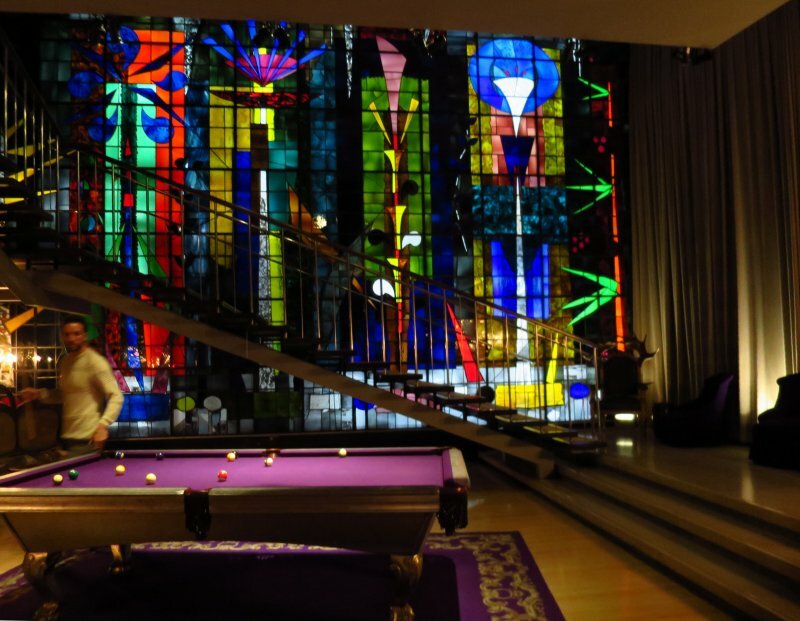 Built in modernist style, it featured a spectacular and very large stained glass window which I was glad to find was still in existence. The tea was outside - although the heaters were very efficient and we were sheltered from the wind. We loved sitting amidst the trees and listening to the fountain. 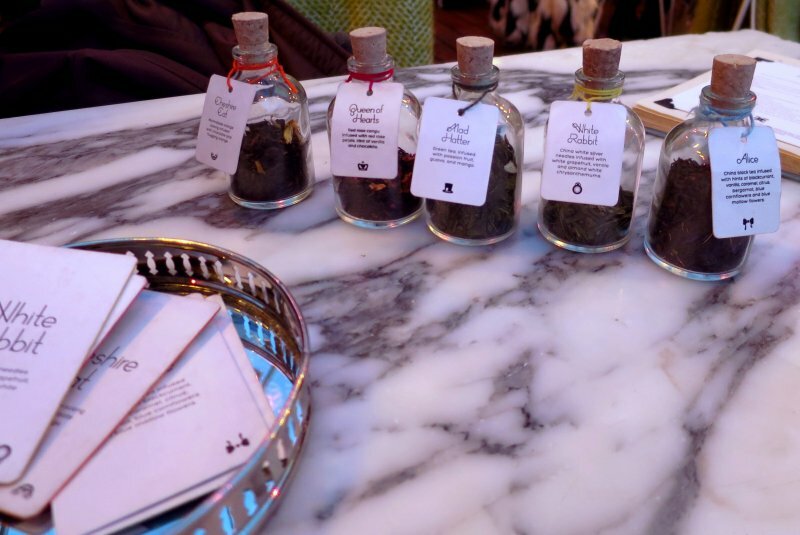 We were really impressed by the quality of the food, which included five delectable blends of tea. I would have bought a box of Cheshire Cat to take home, if it had been possible to buy one. And here is how the tea was presented - with pretty green cucumber sandwiches, all types of cakes, scones and some eye catching mushrooms (complete with a blue chocolate Caterpillar. Here's a closer view of some of the cakes. 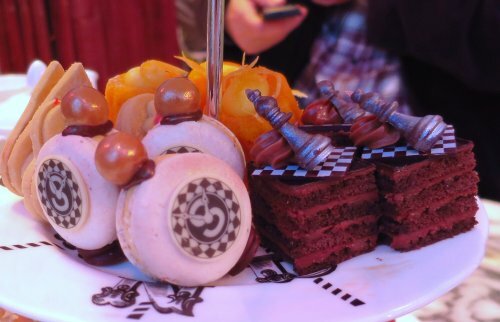 My favourites were the tiny chessboards complete with silvered chocolate pawns, but I also liked the cartoonish pocket watch macaroon which was topped with a specially made Malteser "crown."